The Salmon Pink Custom Pageant Sash is made of quality bridal satin and tailored at the shoulder for customer fit with a velcro closure. The maximum length of lettering is 16". 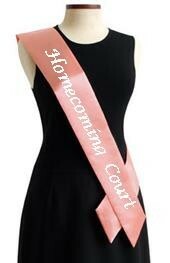 Ideal for pageants, Prom, Homecoming or any other ceremonial event. Includes one color twill lettering. See Options for pricing for two colors of twill.